Provide comfort for the family of Johnny E. Owen with a meaningful gesture of sympathy. Johnny E. Owen, 81, completed his life’s journey on Wednesday, April 3, 2019. He was the first born to the late Everde Owen Hill on November 11, 1937 in Crenshaw County, Laverne, Alabama. He received Christ at an early age at Clay Street Baptist Church, Montgomery, Alabama under the Leadership of Rev. C. L. Webster. He received his formal education in Crenshaw and Montgomery Counties. He was a 1956 graduate of George Washington Carver High School in Montgomery, Alabama. After the early passing of his parents and grandparent, he became the guardian of his four younger siblings and an instrumental part of their upbringing. 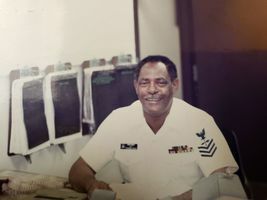 Johnny E. Owen served twenty-three and a half years in the United States Navy as an aircraft mechanic. He had the distinct privilege of serving twelve duty stations and receiving numerous awards during his meritorious service. On July 20, 1981 he married Merrie Jo Salter and became a loving father to three children. They were blessed to be able to join him in his military travels around the world. After his retirement, they settled in Milton, Florida, where he lived out the remainder of his days. Mr. Owen was a lifelong Alabama Crimson Tide fan. He enjoyed barbecuing, debating and spending time with his family. In his spare time, he could be caught watching his favorite western or television drama. Becoming a grandfather was one of his greatest joys. He loved making all of his grandchildren feel as though they were his “special” one. He leaves to cherish his memory a loving wife of 38 glorious years, Merrie Jo Owen; three children, Calvin Barnes Jr. (Marsha) of Milton, Florida, Valerie Johnson (Daren) of Dallas, Texas and Sobrina Wright (Jermain) of Milton, Florida; two brothers, Leon Hill (Jean) and Don Hill (Barbara) both from Montgomery, Alabama; two sisters, Annie Pearl Alexander of Atlanta, Georgia and Helen Marzette of Montgomery, Alabama; thirteen grandchildren; five great grandchildren and a host of nieces, nephews, family and friends who were blessed to know him. Trahan Family Funeral Home handling arrangements. Visitation will be Friday, April 12, 2019 at 10:00 a.m., service, Friday, April 12, 2019 11:00 a.m., at St. John Divine Missionary Baptist Church, burial to follow at Barrancas National Cemetery. To send flowers in memory of Johnny E. Owen, please visit our Heartfelt Sympathies Store. We encourage you to share your most beloved memories of Johnny E. here, so that the family and other loved ones can always see it. You can upload cherished photographs, or share your favorite stories, and can even comment on those shared by others. Provide comfort for the family of Johnny E. Owen by sending flowers. The deepest of all sympathies to Mother Owen and Family. May the love of Christ and his grace, comfort you with all peace. Fair winds and following seas to a shipmate, in the Naval tradition....Bravo Zulu for a life well done!!!!! !